the hamster’s not cheerful at the last seconds of its life..
What’s disturbing is that the Katakana actually says “Ringo to Hamusutaa no aji no aru kyuto no kare” (apple and hamster flavored cute curry) , so the translation isn’t off unless Hamusutaa (Hamster) means something else. Given the picture, I think this is authentic Hamster. Pity, I only like Guinea Pig and Apple. You just can’t get good hamster in this country. At least the hamster died happy. 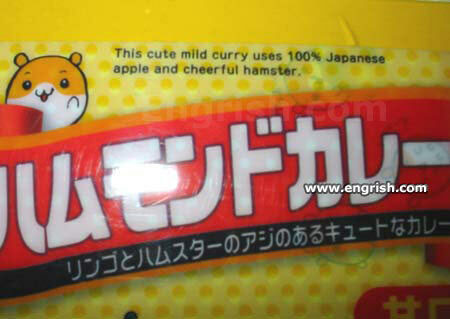 Coz there’s nothing cute about Japanese hamster nor cheerful apples. Japanese apple and cheerful hamster. Will it blend? You can taste the smile. A bowl of cuteness, please, hold the hamster. I tought this is just a bad English discription by Japanese people but actually this was a parody of House Vermount Curry. There are note books, eraser etc. It is kind of cruel for children though…. The cute cheerful hamster will bring many joy on your heart.